I don´t know about you but tiredness has defo been a “thing” for me this week. This heavy, lethargic feeling makes me yearn to unblock the stagnant stuff. Most of the time, backbends are regarded as being the ultimate energisers, little espresso shots of pizzaz. Twists are great for rinsing out or resetting things. Put them together and…well, it´s an interesting recipe for sure. For me, the physical sensation of “stuckness” starts in my hips, so these directions very much start from here. I feel when i use this as my measuring point for the postures, i have an anchor of sorts. It´s the centre of gravity here (which helps with the balancing part of these poses) plus i really (like, really) dig the sensations of opening in my hip flexors and abductors. Of course, we are all different, so we might feel sensation in different places. As long as the sensation isn´t one of pain, we´re good. 1) As always, start by finding your breath. Establish a consistent and spacious rhythm. Then come into high lunge with your left leg forward. 2) With your torso upright and arms overhead, interlace your fingers and reach your palms upwards, at the same time, relax your shoulders away from your ears. Try to let the movement come from your shoulder blades drawing down. 3) With your legs strong and supportive, feel the alignment of your hips. Ideally, you want your left hip under your left shoulder and vice versa. Sometimes, the left hip moves forward in space, so if you have room, gently draw in back a bit. It will automatically adjust your right hip and those of you attuned to your hip flexors might feel a sweet sensation of stretch in that area. You can play around with this (i always encourage a dancing wiggle to find the sweet spot). 4) With hips in the right alignment for your body, use them as your anchor and from this place, lengthen your spine up! It can help to press really clearly into your feet. By pressing down, you might find you have space to become longer. If this is enough, stay here. If you feel you have more space, start to lift your chest up towards the ceiling. As you slowly do this, you might feel your palms naturally start to reach towards the wall behind you, but take your time and feel no pressure to backbend more than feels good for your body. 5) On your inhale, lift your upper body and arms back to centre, and press strongly into your front foot whilst straightening your front leg. Hinge forward from your waist and fold your upper body half way forward so your chest is parallel to the floor. At this point, you will probably know how your hamstrings feel. If you need, gently microbend your front knee and take your hands to blocks or books – whatever brings the ground to you. 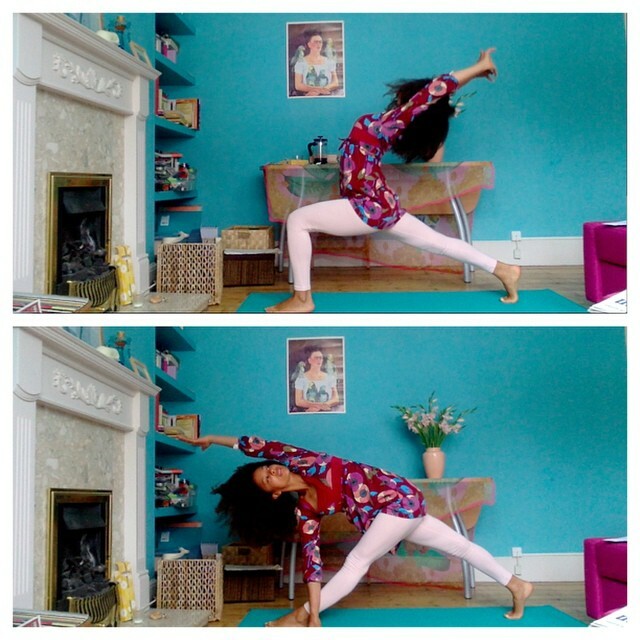 6) Feel the alignment of your hips just like you did in the lunge. If necessary and possible, gently draw your left hip back in space again. I like to imagine i have a blueberry between the top of my thighs here (yes, a blueberry, but use whatever visualisation works for you) and i´m gently squeezing it. Here´s the toothpaste again – As you inhale, see if you can lengthen your armpits away from your hips. Get long through the side body, and carry that length out beyond the crown of your head. Beyond your fingertips even. 7) Take your right hand to the outside of your left foot (if the floor feels too far, you know what to do —block/book/whatever works). Slowly reach your left fingertips into the air, then (imagining your best super slow mo air guitar impression) arc your top arm towards the wall in front of you, palm facing down. Mmm, outer hip interestingness…. This pose is a variation of Rotated Triangle pose. 8) Keep hold of your blueberry! If balance is still feeling flipping crazy, try fixing your gaze on something still. Also, check your head is in a position that feels good for your neck. You can look up, down, to the side or wherever works. 9) To come out, take your left fingertips to the floor and bend your front knee. Step back to down dog and repeat on the other side. This entry was posted in 5 minutes, health, inspiration, lifestyle, postures, recipes, sequence, yoga recipe and tagged blueberries, energising yoga, high lunge, hips dont lie, lick yoga, Try yoga, try yoga with dionne, Yoga Everywhere, yoga hips, yoga postures, Yoga Recipe, yoga sequence, yoga twists. Bookmark the permalink. ← Kulturnatt // Yoga Disco & Silent Art Disco – Pictures and Videos!